Dr. Marcia Boyd and Dr. Burton Conrod (DDS ’76) were granted Honorary Degrees during the Centennial celebrations. Alumni from as far back as 1950 gathered in Halifax, Nova Scotia, from May 23 to 26 for Dalhousie University’s Faculty of Dentistry Centennial Celebrations. The 100th anniversary of the faculty’s first graduating class was commemorated during this 4-day event. More than 1,100 alumni, faculty, staff, students, supporters and friends were in attendance to celebrate, reflect upon the faculty’s progress and accomplishments, and look ahead to future challenges and opportunities. Guests were welcomed to the event with a surprise flash mob, fittingly performed to the song "We Are Family." Even those who move on from the faculty remain part of the family. Many in attendance noted the school’s improvements over the years, while another referred to her time at Dalhousie as "the best job I ever had." Members of the "faculty family" also delivered all of the continuing education courses held during the Centennial. They shared their knowledge of the dental profession, as well as their passion for the school. This was particularly notable at the closing Celebratory Dinner. One alumnus spoke to the crowd of more than 700 that he really felt like part of a family when he sat in on a lecture and watched his former professors become emotional as they talked about their time at Dalhousie. Dr. Tesia Rolle, a graduate of the class of 2012, performed a powerful spoken word poetry piece about the faculty’s commitment to oral health. In the piece, she referenced the ADEAGies Foundation’s William J. Gies Award for Achievement, which the faculty received in April for its contributions to oral health care and dental education. "That legacy is recognized, widely acclaimed as ‘One of the Gies,’ and I am proud to be a vessel in which that legacy now resides. I was guided here by well-trained minds, taken on a journey by caring souls. Some were a little scary, but I know that my training was ever the goal. From Dean Woodbury and the NSDA to other associations supporting our craft. From the welcoming dean and faculty to the warm and caring staff, from the brave and patient patients to my classmates who shared this path. We all of us have committed to something that is grander than ourselves, to eliminate the voids in the ethical provision of oral health. I came to this school with the intent to see a career obtained. I leave now with the pursuit to excel as one with a mind well-trained." Throughout the Dalhousie Dentistry Centennial, we celebrated the achievements of our faculty and the many talented individuals who have been associated with this wonderful institution over the past 100 years. I was thrilled that so many members of our "faculty family" were on hand to help us recognize just how far we’ve come. At the same time, I can also appreciate how our founders felt when this faculty was in its infancy. They were looking toward the future, just as we are today. It was through their vision, leadership, self-sacrifice and dedication to the oral health of Nova Scotians that our faculty was inspired to become what it is today. Following this example, we continue on the road toward excellence. The faculty is preparing for the future through our innovative research and curriculum and clinic renewal, to ensure that we remain focused on patient care and access to care for all populations. We want to provide our students with the appropriate experiences and opportunities that will improve people’s quality of life through oral health care. When I think of the future, one quote comes to mind—an inspiring message from Jack Layton, who in his final letter to Canadians, said: "My friends, love is better than anger, hope is better than fear, optimism is better than despair. So let us be loving, hopeful and optimistic and we’ll change the world." 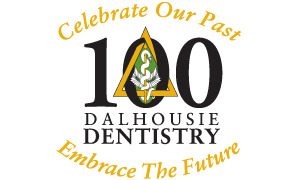 I would like to sincerely thank all who helped us celebrate our past and embrace the future of dentistry at Dalhousie. Together, we will ensure that the next 100 years are as successful as the first! Dr. Boran is dean of the faculty of dentistry at Dalhousie University.